This very short introduction to trams in Rangoon is based on information from Dr. Tilman Frasch's article 'Trams in Rangoon: They first ran 100 years ago' (published in 'Tramway Review' No. 213 May 2008) and other sources. 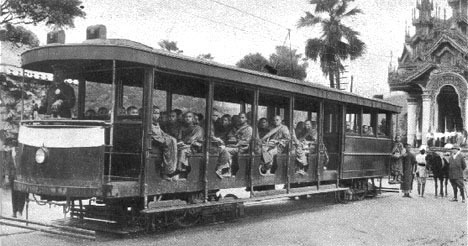 The first tramways in Rangoon used steam trams. A successful local businessman, John Darwood had a concession to operate steam trams but, after a few unsuccessful years of operation, he sold out to a company from Calcutta. This company was equally unsuccessful and went into liquidation in 1899. John Darwood re-acquired the concession in 1902 in order to operate an electric tramway. Since all the equipment had to be imported from Britain, start-up costs were high so John Darwood sold the concession, retaining an interest, to British investors and the Rangoon Electric Tramway and Supply Company was registered in Liverpool in 1905. The power station and headquarters were in Ahlone Township. One line ran along Dalhousie Street (now called Mahabandoola Street) to Sule Pagoda, then turning north then east along Montgomery Street (now called Bogyoke Aung San Street) to Pazundaung Jetty. A branch leading uphill along China Street served the south gate of the Shwedagon Pagoda. The system was further extended up until the mid 1930s, by which time it was carrying over 40 million passengers a year. For a better idea of the street layout, you can refer to the Rangoon Guide Map of 1930 (published under the direction of Brigadier R. H. Thomas D.S.O., Surveyor General of India). There's a series of photographs showing parts of this map here. Dr. Tilman Frasch reports that, in 1909, a special, decorated trailer was introduced for the purpose of carrying coffins. A marvellous postcard of an electric tram at the Shwedagon tram terminus in the 1920s. This postcard appears on an interesting blog page here which describes the life of businessman and philanthropist Sir Adamjee Haji Dawood (1880-1948) who was a director of the Rangoon Electric Tramway and Supply Company. Rangoon is the capital, commercial center and principal seaport of Burma. Site of an ancient Buddhist shrine, the gold-covered Shwe Dagon Pagoda, the area was occupied by the British in 1824 and became Burma's capital in 1852. The British built large public buildings, parks and gardens and opened a system of steam tramways in 1884. An electric tram system followed on Dec. 15, 1906, and by 1921 there were 22 km of track and 77 cars in operation. Japanese air raids destroyed the power plant during World War II. The postcard below shows Buddhist monks setting out on a tram to collect alms. Another card in this series shows their return. The other part of the company's business was providing electric street lighting and electricity for commercial and private use. The Municipal Commissioners decided that electricity generation and transmission should be under their control and, in 1937, a municipal power station was opened. This was destroyed in 1942 during Japanese air raids on Rangoon. Later, the Rangoon Electric Tramway power station was destroyed by the British to deny the facility to the advancing Japanese. The Japanese were able to bring the municipal power station back into use until 1944 when they destroyed it in the face of Britain's re-occupation. After the war, limited generation was not resumed until 1950. The Rangoon Electric Tramway was nationalised as part of the Rangoon Electricity Supply Board in 1953 and, following prolonged wrangling over compensation for the shareholders, the Rangoon Electric Tramway was dissolved in 1961. 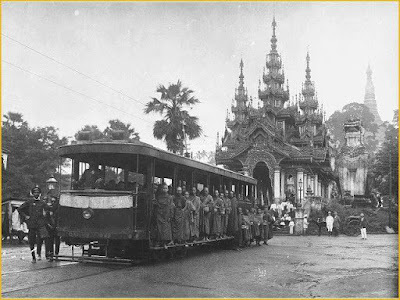 'Electric traction in the Burmese capital: A history of the Rangoon Electric Tramway and Supply Company, Limited' by Robert Sechler: published in 2000, Los Angeles.